Shipping will be FREE for orders over 200 euros (VAT included) in mainland Spain and 400 euros (VAT included) in the Balearic Islands. The shipping costs for orders under 200 euros in shipments to mainland Spain will be 5.50 euros (VAT included) and for orders less than 400 euros in the Balearic Islands will be 15 euros (VAT included). 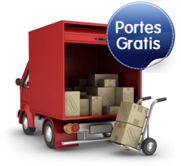 » Shipping is free for orders over 200 euros (VAT included) in shipments to mainland Spain and for 400 euros (VAT included) in the Balearic Islands. For orders less than these amounts, postage will be 5.50 euros (VAT included) in shipments to mainland Spain and 15 euros (VAT included) for the Balearic Islands. » The delivery will be made at the address you decide. If you want to change this address, you only have to specify it at the time of placing the order in "Add new delivery address". » At all times you can track the delivery of the order by entering our website with your name and password or through our landline or mobile. » The shipments will be made through the transport companies with which we have preferred agreements. Shipping within peninsular Spain will be made in 24-48 hours (working) depending on the delivery point. » The goods travels fully insured and the customer must notify of any problem such as breakage, in order to claim the replacement of the material within 24 hours after receipt of the same. After those 24 hours, the companies no longer take charge of the damaged material, so www.ElectroMaterial.com will look for the least harmful solution for both parties. » Delivery times can be altered by extraordinary incidents in the carrier and by difficulties in the delivery of goods (for example, storms or strikes). » In case there are problems with the delivery, a contact telephone number will be provided to the transport agency that the buyer must provide to ElectroMaterial.com.